It was the loaf pans, I think. They were at the start of all of this. When I set about baking homemade sandwich bread, I tried Julia Child's recipe. A recipe which specifies a 8-by-4-inch loaf pan, instead of the more common (and larger) 9-by-5-inch variety. After baking my loaves and admiring their modelesque proportions (slim, tall), I was smitten. I took to baking many of my breads and cakes in these pans, thinking there was no harm in my fondness for foods on a smaller scale. But those pans served only as a gateway to increasingly-elfin baked goods. When baking a pound cake, I brought out miniature tube pans and split it into six. Banana bread was divided into eight little loaves to be tucked into lunches. My super-secret recipe Chocolate Crunch Bars were made in individual squares, rather than a monstrous slab. Somewhere along the way of this Lilliputian baking, I had two realizations. Well, one realization, and one moment's pause. First, I realized I have amassed more than a few baking pans. Second, I became somewhat self-conscious about my weakness for the wee. You see, dear reader, there has been some recent criticism of diminutive cakes. I can agree that some cupcakes are over-the-top sweet, with such an excessive helping of tooth-aching frosting that they are nearly impossible to enjoy. And I do think that some bakeries have gone a trifle mad in their pricing of these cakes. But I cannot subscribe to the theory that lies at the root of much of the disapproval. The objection of the individuality of the single-serving cake, a trait seen as embodiment of the "mine-all-mine" mentality that represents all that is wrong with the world. In the eyes of these critics, the small is associated with the sole, and that is seen as sad. Lonely, even isolated. And so, if no man should be an island, should no cake be a cupcake? Has this predilection for the compact been the result of a larger trend of greed? Now lest I ignite a debate on whether or not there is room in this world for a moment to treat oneself (I am firmly in the "yes" camp on that one), I will instead consider the fact that most of these criticisms are aimed at the purchase of cupcakes. There is no mention of making cupcakes; making them is another thing entirely. Making small cakes almost always ensures sharing. The sheer number of of treats made in a single batch encourages generosity. Sure, a large cake can be doled out in slices and wrapped for giving, but most often it is served to those who happen to attend a specific event. In contrast, an armada of cupcakes (baked right in their travelling clothes) are perfectly suited to be sent out into the world - event or not. You see, small cakes can be more approachable than one behemoth beauty. A layer cake on its pedestal is lovely, but a bit standoff-ish. All-too-often I have been at a party, admired the cake perched prettily on its stand, and noticed that nary a crumb has been touched. Unless the host serves, rarely does a guest feel bold enough to "be the first" to mar its pristine completeness. But set out a tray of cupcakes, or single-serving squares, and they are scooped up before you can bat an eye. Little cakes are just that bit friendlier. They do not stand on occasion. While a slice of cake may seem like it requires a holiday, a small cake slips easily into the everyday. While we are at it, small cakes are cute and neat. Sure it is shallow, but even though I love some messy fun in the kitchen, I do believe that the recipients of my efforts appreciate the clean edges that personally-portioned baked goods provide. I am routinely inept at cutting straight lines, and so perfect shapes would surely be preferred over my mangled efforts. But, all said, there is one trouble with making petite treats. Miniature baking pansare truly infuriating to keep clean. I have a serious case of dishpan hands from scrubbing all those teeny-tiny nooks and crannies. Adapted from a recipe for Chocolate Chip Mascarpone Cupcakes by Giada de Laurentiis. 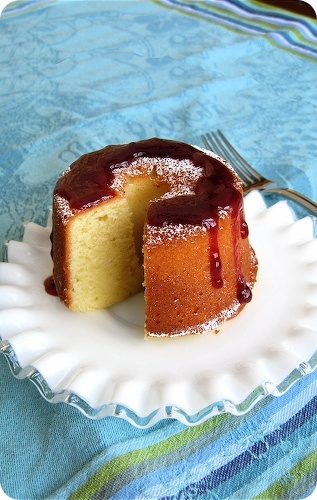 A note on its flavour; despite its appearances, this cake is not overly rich. It is the sort that is best with a cup of tea in the afternoon, or as a simple dessert. Canadians (and some Americans), will find the taste of this cake is strikingly similar to the chocolate glazed doughnuts from well-known national chain. Make the cakes. Preheat an oven to 325°F (160°C). Butter and flour two 8-by-4-inch loaf pans, set aside. Place the two types of chocolate in the top of a double boiler or a heat proof bowl set over a pan of simmering water. Stir until melted; remove from heat and allow to cool slightly. In a small bowl, whisk together the water and sour cream to combine. Set aside. In a large bowl, using a hand mixer or whisk, beat together the sugar and oil until well blended, around 1 minute. Add the eggs, one at a time, beating well after each addition. Scrape down the sides of the bowl as needed. Stir in the vanilla, then the cooled chocolate. Add flour mixture alternating with sour cream, starting and ending with the flour mixture and stirring until just blended. Stir in the chocolate chips. Divide the batter between the two prepared pans and bake until a cake tester inserted into the middle of the loaves comes out clean, around 55-65 minutes. Remove from oven, cool 10 minutes in pan, then remove the cakes to a wire rack to cool completely (right side up). For the glaze, take the shot of espresso and pour it into a 1/2 cup liquid measure. Add enough water to bring the level up to a 1/2 cup. Pour the water mixture, sugar and cocoa into a small saucepan and whisk to combine. Bring to a boil over medium heat, stirring occasionally. Simmer until the glaze is thick, about 5 minutes. To glaze the cakes, set the cooling rack over a rimmed baking sheet. Using a pastry brush, paint the glaze all over the top and sides of the cakes; carefully apply multiple thin coats for the finest finish. Let stand until set. Makes two 8-by-4-inch loaf cakes. • If you do not like espresso, use only water for the glaze. 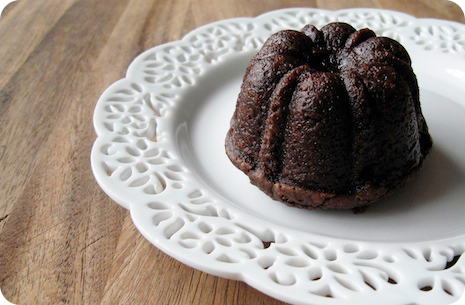 • The cake pictured was baked in a Nordic Ware Pro Cast Brownie Bundt pan (thanks Mum!). In this size, the recipe will yield about 36 cakes. And now for the giveaway. The fine folks at Subscription.com were generous enough to offer me a complimentary magazine subscription. Sadly, I am unable to take advantage of their kindness due to international distribution restrictions. So, we thought to pass the offer on to you. Subscription.com will give one reader a full-year subscription to the cooking/food magazine of their choice (as selected by the winner from their list of titles). There is no cost to be incurred by the winner, the only condition is that you must be is a resident of the United States or have a US mailing address. To enter, leave a comment at the end of this post, with a mention of your desire to be included in the draw, and I will compile these comments into a master list (this way, non-entrants can still comment if they'd like). A random winner will be selected and announced on April 21, 2009. My apologies to Canadian and international readers for their exclusion. There will be some more giveaways in the future to make it up to you; please understand that I simply could not pass up the opportunity to share this prize.